In 1524, Giovanni da Verrazano was the first person from Europe to sail through the narrows (in between Brooklyn and Staten Island). In 1964, the bridge opened as the world's largest suspension bridge. The over $300,000,000 it cost to build has since been matched and surpassed in toll earnings. 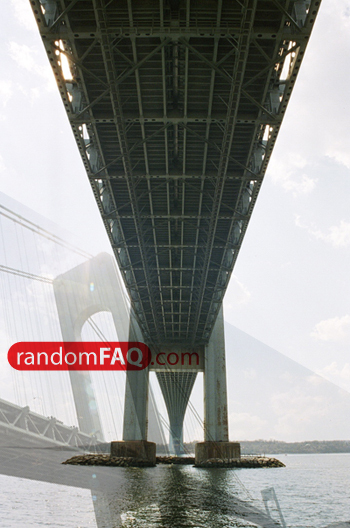 The towers of the bridge lie 4260 feet apart from each other. There is an extra 1 5/8" in length between the tops of the towers. This is necessary because the overall length is long enough to need the earth’s curvature factored in to any calculations. Also, in the summer the roadway is 12 feet lower than it is in the winter due to expansion.